The Defence clasps add a certain something to the QSA so I thought they were long overdue for their own page on the forum. My thanks to Baldwin for allowing this image to be reproduced. of October, 1893, having some previous experience with the 3rd North Lancashire Regiment (Militia) and having worked as a Collier. He served at Home, in India, and in South Africa during the Second Boer War, having taken part in the Defence of Kimberley. He was discharged from further service in October 1905, having completed 12 years with the colours. My thanks to DNW for allowing this image to be reproduced. Harry Vaughan Gorle was born at Poughill, Cornwall, in September 1868, the third son of Captain John Gorle, late of the 28th Regiment. Educated privately, he was commissioned as a Lieutenant, via the Militia, in September 1893, and joined the Army Service Corps in the following month. Advanced to Captain in April 1898, Gorle witnessed active service in South Africa, initially as D.A.A.G. 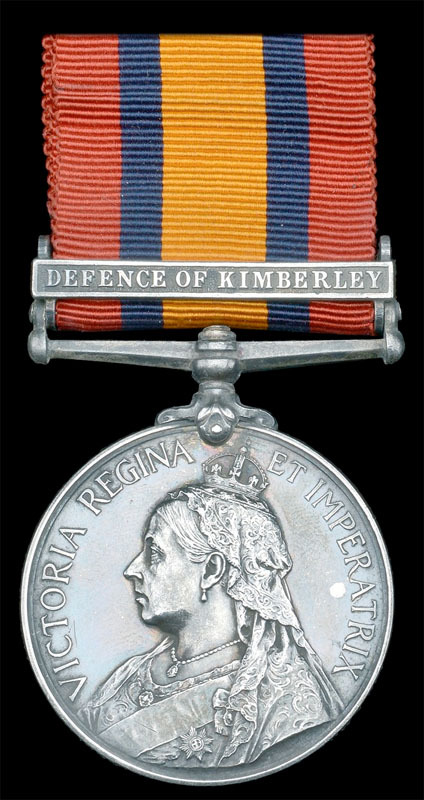 in the defence of Kimberley from October 1899 to February 1900, where he had charge of arrangements for all supplies and transport for the 5000-strong garrison. He was mentioned in despatches (London Gazette 6 May 1900 refers). 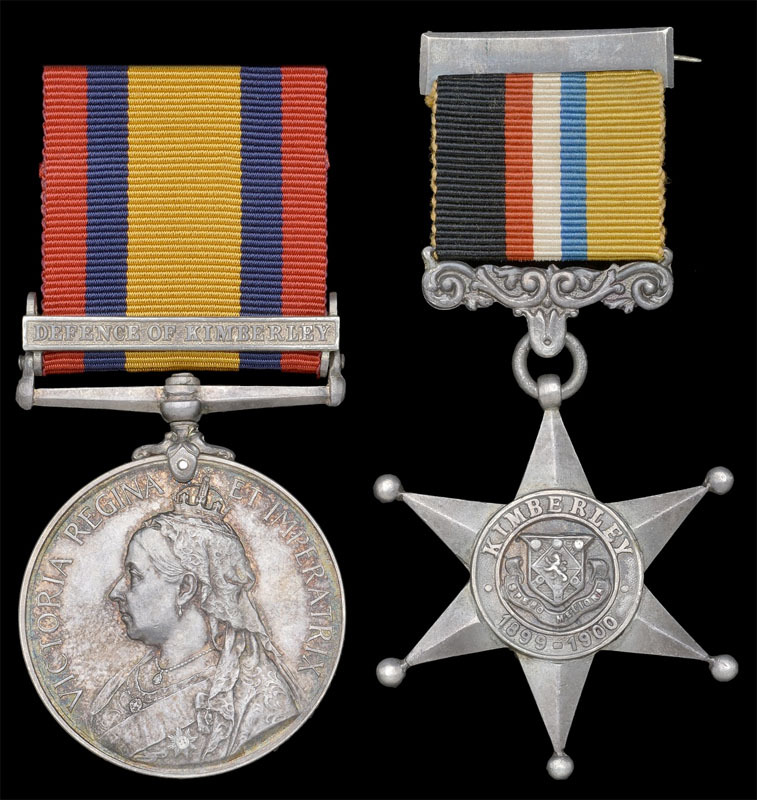 Subsequently employed in operations in the Orange River Colony from May until November 1900, and again in the period March to May 1902, he served in the interim in Cape Colony, gaining another “mention” (London Gazette 10 September 1901 refers), and the D.S.O., which latter insignia was presented to him by the Officer Commanding Troops at Kronstadt in September 1902. Advanced to Major in February 1905, Gorle was placed on the Retired List in June 1908, but he was recalled in the Great War and witnessed further active service in the Macedonia theatre of war from August 1916 until June 1918, gaining another “mention” (London Gazette 11 June 1918 refers). His son by his first marriage, Lieutenant Robert Vaughan Gorle, Royal Field Artillery, was awarded the V.C for great courage at Ledeghem in October 1918, when he fired his gun over open sights under direct machine-gun fire from a range of just 500 or 600 yards ‘ his disregard of personal safety and dash were a magnificent example to the wavering line’ (London Gazette 14 December 1918 refers). The QSA to Pte C H Scott, KTG. He served in G Company during the siege. The pair to Pte E H Von Plaster, KTG. Pte Algernon Parker died on 11 Nov 1899 more than 6 hours after being wounded in one of the lesser known Kimberley skirmishes. 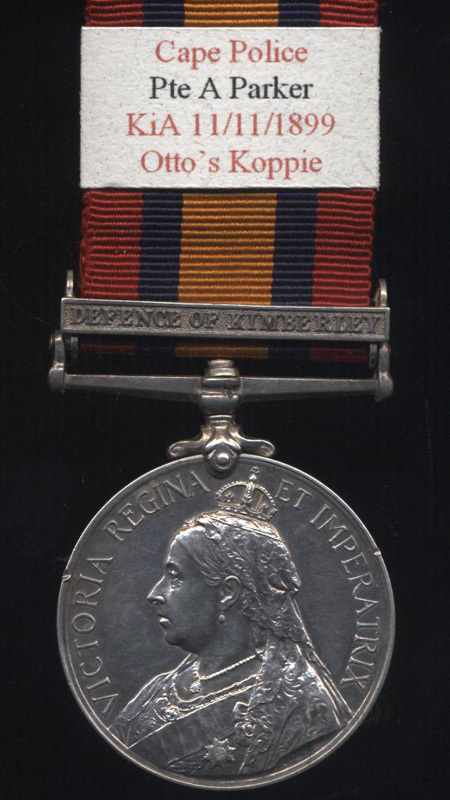 On p47 of "The Siege of Kimberley" (the Special Illustrated Number of the 'Diamond Fields Advertiser') mention is made under that date of "a brisk little encounter with the enemy near Otto's Kopje......One of the men of the Cape Police, Division 2, named Parker, was mortally wounded..."
In "Kimberley under Siege"(p77) the incident is also briefly mentioned :"...Mounted troops, under Col Scott-Turner, engaged the enemy near Otto's Kopje about 4 pm and did damage. Our losses : one killed (Trooper Parker, Cape Police), one wounded....."
However, the circumstances surrounding Parker's demise is forcefully brought home by the entry for 11 November in Nurse Francis Wookey's diary, as published in "Summer of 1899" (p133) : "At 10.30 pm the ambulance came up, bringing a Cape policeman. The first thing he said when he was put on the operating table was 'I wish you would let me die at once'. He is shot right through the body and cannot live long. Every few minutes he asks how much longer he has to suffer. 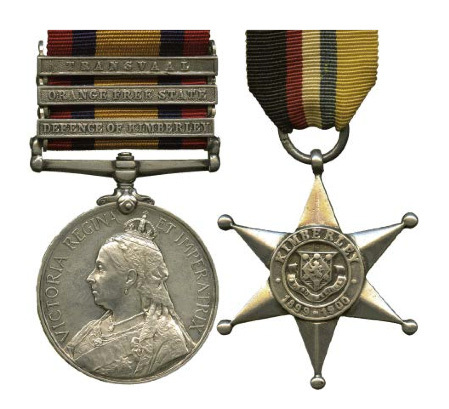 It is terribly sad"
I often wonder when handling a medal to a casualty whether the man was killed instantaneously or had a shorter or longer period of pain and misery before he finally died, as was the case with Pte Parker. A wonderful QSA to a Cape Police casualty. Algernon Parker was born in London and attested into the CP dist 2 in Kimberley on the 2nd May 1898 as Pte 609. He was 24 years and 8 months old at the time. He was a Clerk by Trade. Parker also had previous service in the BSA Police and H.M Customs. Thanks for posting the medal. Thank you for posting Parker's medal and his sad story. Reports of "mortal wounds" in the Boer War conjure up pictures of terrible suffering, but few are as frankly recorded as that of Parker. The stories behind some medals are frightful to learn. To have been severely wounded or mortally wounded as was the vase with Algernon Parker must have been dreadful. The skirmish on the 11th involved 116 men with 116 horses of the Cape Police plus their maxim detachment of 7 men, one gun and 8 horses. During the engagement, the CP expended 3,840 small arms rounds of a total of 4,494 for all the force engaged. Of this, the maxim fired 110 rounds. Algernon parker was their only casualty. There were two men wounded that day and 5 horses wounded.